Versatile and adaptable to every room in the house. Durable construction incorporating 4-2+ In. thick posts. One in each corner. It is solid as it is useful. Secure Shelves. Mighty Carts unique reversible shelves are indeed a marvel. Install then with the 1 In. high retaining side facing upward and you will make sure bottles, cans, knickknacks or other breakables remain where they belong...secure on the shelf. Especially, during transport. 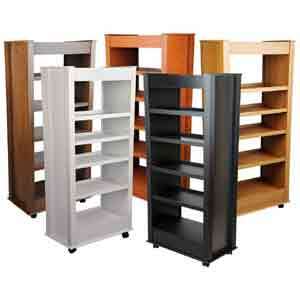 Turn them over and create a smooth flat surface for easy to reach books, stereo equipment and more. Available in 5 attractive colors: black, cherry, oak, walnut and white. Constructed from durable, stain resistant, laminated wood composites Include two 4 In. deep storage bins (1 at the top and 1 at the bottom) 5 Adjustable/reversible shelves Increases productivity Easy to clean Assembly required Made in the USA. Available in Walnut, Cherry, Black, White and Oak Finishes.